Registered Dietitian Corinne Gilardi is a Miami alum who has recently joined the Dining Services staff. She helps students who have dietary restrictions (allergies, intolerances, preferences, etc.) determine what they can safely eat on campus. Q: When you were at Miami, what was your major? A: I was a double major in Dietetics and Health Promotion. Q: How did you pick your major? A: I chose my major randomly. My mom’s a nurse practitioner, so I’ve always grown up around the medical/health field. I knew I wanted to do something like that, but I quickly found out I cannot do “nurse things,” so I was trying to find alternate options. When I was applying for Miami, I didn’t want to apply undecided on the application. I just scrolled through the options and nutrition popped out. So I said, “Okay, I’ll click that for now and we’ll see how it goes.” Then my first class freshman year was Intro to Nutrition and I fell in love ever since. Q: How did you get in to food services? What was your experience? A: After I graduated from Miami in 2016, I had to do a dietetic internship. All registered dietitians have to do this internship before they can take their boards to be a registered dietitian. During my internship, I had to do rotations in clinical, community, and food service. When I did my food service rotation, I was in Cincinnati, Ohio, and I did my rotation with Cincinnati Public Schools and Norwood City Schools. Through that, I found that I really enjoyed working with students and educating and making sure that they were aware of the foods that they could eat. Q: What would you say is the most exciting part of your job? A: The most exciting part of my job is working with the students and them seeing that they’re able to eat a lot of the foods that we have on campus, being a nut friendly facility, the allergen station at Western, and the gluten friendly station at Maplestreet Commons. Some students who have a lot of allergies are very concerned about what they can and can’t eat. Once they meet with me, it’s fun to see them be excited about the options. Q: How would you describe yourself personally? What are your hobbies? A: I’m outgoing. I like to talk a lot and make new friends. I like to hang out with my sister; she’s my best friend. I like to cook, exercise and go try new restaurants. I’m a total foodie. My friends and family are important to me! Q: What is your favorite dish to prepare? A: I’m Italian, so I like to make my great-grandma’s spaghetti and meatballs. It’s just a good comfort food. Maybe not the most healthy… but that’s alright. Moderation! Moderation is my key to life. Q: What is your favorite dish to eat? A: It’s not a dish, but my favorite food is ice cream. Graeter’s Black Raspberry Chip all the way. A: Grey’s Anatomy. I’ve become very addicted to it. I started watching it when I was a freshman in college and I think I’ve watched it all the way through two or three times. A: Dog. I have two dogs actually: Cookie and Faith. Q: What have you learned so far in your position? A: I’ve learned that communication is key. You learn communication when you’re in school about making sure you email, but it’s not just email communication. It’s the face-to-face communication and making sure that everyone is on the same page. I think that’s the biggest thing I’ve learned throughout this process. Not only making sure that you’re saying the right things, but that you’re also telling it effectively to everyone who needs to know. 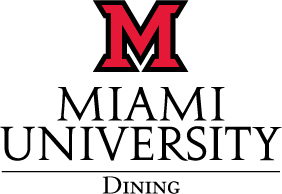 Q: What is your advice for a student applying to work in Miami University Dining? A: Just do it! When I went to school here, I worked in a dining hall for two years. I did that because I needed money as a college student, but I also did it because it gave me something else to do. I wasn’t just sitting in my room or sitting in an academic building doing homework all the time. It took up a couple hours out of my day. But just do it. And if you have questions, reach out. Ask the managers. Ask the student managers. Get involved! Executive Chef Casey Johnson is passionate not only about his craft, but about his job here at Miami and his family. He is one of five executive chefs on campus and he takes care of Armstrong Student Center, Bell Tower Commons, and King Cafe – Armstrong being the place he spends most of his time. Update: As of Monday, November 20th, Casey Johnson was promoted into the Corporate Executive Chef role of dining services. We are excited about him being in this new position! What is your background like? Personal/Professional? I am from Sylvania, Ohio right outside of Toledo. I went right out of high school to culinary school at the Culinary Institute of America in New York. From there I did my externship at the Greenbrier in West Virginia, which is a big hunting/equestrian high-end style resort. After graduating, I did an MIT (manager in training) program at school and was a sous chef for a restaurant on campus. After moving back to Toledo with my wife, I held a sous chef position at a local country club and an Italian restaurant called Mancy’s for 3-4 years. After my time at Mancy’s, I accepted a food and beverage director/executive chef position at the Hilton Garden Inn in Findlay. My wife was then accepted into a position here at Miami, then I was lucky enough to accept a position here a year ago in October. What is the most exciting part about the job? Not just in this job, but in the industry in general, you learn something new every day. I am not a desk person and I don’t like sitting still, which is perfect for this industry. I don’t really know. I am the only chef in the family other than a far extended cousin. I always grilled with my dad and baked with my mom, but neither of my parents are culinarians. I grew up on your basic mid-west style cooking with mayonnaise-based casseroles and flank steak (haha). I am not sure on what made me want to do it, but it is probably a love from the arts. I wanted to be a zoologist, then a photographer, then an architect, focusing my mind on the arts. How would you describe your relationship with the guests? Friendly! I love talking and working with the guests. Some people would be shocked to find out I’m introverted, but that’s because I’ve challenged myself to be extroverted to improve my overall communication. As a food and beverage director prior, I had to work directly with guests, which improved my customer service. I’m still getting used to seeing so many students, even though we have some regulars, it’s a joy to meet new people everyday. What is your favorite thing about MU Dining? I like the diversity of it! I think that working within the department and with the direction we are going, it’s going to get even more diverse. I know most dining has pizza or stir-fry, but we get to do new and exciting dishes here – with more to come! I helped collaborate with the opening of 4 new concepts in Armstrong – the Toasted Bagel, Cafe Lux, Red Zone, and Haines update. How would you describe yourself personally? I am passionate. If we talk food, I can talk all day due to my passion for the industry itself. I drive myself because of my passions and for the food industry. I definitely take my pride for work home and instill the idea of passion to my daughter as much as I can. Honestly, I genuinely love hanging out and cooking with my daughter because I’m a family man. I like to cook at home as well but not as high-end cuisine. I really enjoy photography. Since the industry is so busy, it’s tough to have hobbies outside of work, but I’ve recently picked up photography again. I definitely want to start hiking and biking more because I really like spending time outside. Doing activities help me to clear my mind from the busy weeks I have. What is your favorite dish to prepare? To eat? Parmesan Risotto. The simplicity comes with its ingredients, but it’s a dish that takes passion to execute properly. As far as a favorite dish to eat, that changes all the time. I prefer cooking Italian though. I was trained more in Italian-style of cooking. The French-style is to take the ingredients and make it their own, while the Italian-style is to take the ingredients and enhance the flavor that is naturally there. I’ve always watched House and can habitually watch it. The Office is also one of my favorites. I enjoy the comedy in both. I am a dog person. I have a wheaten terrier at home. I am allergic to cats and dogs in a way. Any advice for people applying/working for MU Dining? This is a great place to work! You’re not going to find better benefits and community in this area. We want people to apply and want people here. It requires time on your feet and work ethic, but it pays well and has a welcoming feel to it.